Highly Praised Novel (‘It’s a Classic’) Answers the Big Questions: What Happens After Death & Where to Spend ‘Eternity'? This thought-provoking novel by Dr. Thomas E. Berry delves into what may be the most important question people ever face: Where to spend Eternity? The time has come for Tom to die. When he sees the light ahead, he wonders who will be waiting for him. Will it be Jesus, Mohammed, Moses, Vishnu, Buddha, or another prophet? Everyone wonders what happens after death. For Tom, dying takes him to a misty tunnel. In the distance, he suddenly sees St. Peter at the world’s largest computer, where they discuss Tom’s life. St. Peter decides Tom should visit all the different heavens to see exactly where he wishes to spend eternity. Tom goes to the Protestant, Catholic, Hebrew, Muslim, and other heavens. Then he makes his selection. Where will Tom spend Eternity? This thought-provoking novel delves into what may be the most important question people ever face: Where to spend Eternity? About the Author: Dr. Thomas E. Berry is a retired professor of Russian language and literature. He lectures for John Hopkins University, the Smithsonian Institution, the Russian Cultural Center of the Russian Embassy in Washington, D.C., and on international cruise lines. Dr. Berry received a “Gramota” from the Russian Government for service in fulfilling peaceful relations between Russia and the U.S., has published academic books and six novels listed on Amazon.com, and travels extensively. “This eye-opening book makes for a fascinating read, as it answers questions in easy terms about the world’s great religions. Where would you choose to spend Eternity?” said Robert Fletcher, CEO of Strategic Book Publishing and Rights Agency. 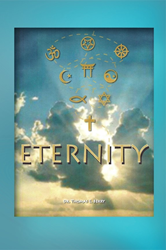 ETERNITY (ISBN: 978-1-61897-433-4) is available for $12.50 and can be ordered through the publisher’s website: http://sbpra.com/DrThomasEBerry or at Amazon.com or Barnesandnoble.com.